Ive emailed DC to ask for his view re 911. Doubt he will reply. Be great to see DC on this board tho! When, in October, I showed that the chemical lists found in London were an exact copy of pages on an internet site in Palo Alto, California, the prosecution gave up on the Kabul and al-Qaida link claims. Exactly the same MO in the Dhiren Barot "Mr AL Q UK" Dirty Bomb / Gas Limo" farce. In January 2003, the British media splashed the news that anti-terror police had disrupted an Al-Qaeda cell, poised to unleash the deadly poison ricin on the capital. Police had reportedly found traces of ricin, as well as a panoply of bomb and poison-making equipment in the cell's 'factory of death' - a shabby flat in north London. 'This danger is present and real, and with us now' announced prime minister Tony Blair. But, when the 'ricin plot' came to trial at the Old Bailey, a very different story emerged: there was no ricin and no sophisticated plot. Rarely has a legal case been so shamelessly distorted by government, media and security forces to push their own 'tough on terror' agendas. In this meticulously researched and compellingly written book, Lawrence Archer, the jury foreman at the trial, and journalist Fiona Bawdon, give the definitive true story of the ricin plot trial and its aftermath. Lawrence Archer is the telecoms engineer who was foreman of the jury at the 2005 ricin trial. He has followed the lives of the acquitted defendants ever since, including attending their High Court and immigration appeal hearings. Fiona Bawdon is a freelance journalist. She writes on criminal and civil justice issues for the national and specialist legal press. Foreword my Michael Mansfield QC. The book is dedicated to the British jury system. Bravo Mr Archer & Fiona Bawdon. A JUROR at the trial of an Islington man currently being held under virtual house arrest two hours outside London has written a book that he hopes will help free him. Ricin! The Inside Story of the Terror Plot That Never Was, by Lawrence Archer, tells the story of the so-called “ricin trial” of 2005, at which five men connected through Finsbury Park Mosque were charged with plotting to manufacture the toxic chemical ricin for use in a terror attack. Four of the five, including Mustapha Taleb of Highbury, were acquitted. However, despite never being found guilty of any crime, Mr Taleb has suffered severe restrictions on his movement ever since. He was detained in Long Lartin prison, Worcestershire, for 56 months and is currently under a control order, having been deemed a threat to national security by the Home Office. He is also facing deportation to his home country of Algeria. Mr Archer said: “When the ricin trial finished I was prepared to disappear into the background. Then I found out that the four men who had been acquitted were scheduled for deportation to Algeria. Restrictions placed on Mr Taleb by the Home Office – he must wear a tag, his movements are monitored and he is only allowed out of the house for a set number of hours a day – were made ­possible by new laws introduced after the terror attacks in America on September 11, 2001. Mr Archer’s book – co-written with freelance journalist Fiona Bawdon and barrister Michael Mansfield QC, and due to be published in September – also accuses the UK government of using discredited evidence to push through tougher anti-terror laws. Mr Taleb’s case has been taken up by Campaign for Nuclear Disarmament activist Bruce Kent, who has been visiting him for the past six years. There is no absolute ban on jurors publishing books about trials they have been involved in, but it is believed that Mr Archer’s book will be only the second such account to be published in the UK. Former jurors are permitted to talk about evidence presented at trials they have served on, but are barred from giving details of deliberations. Like most jurors, Lawrence Archer was a typical, not especially political member of the public, a BT engineer who was called for jury service at the Old Bailey in 2005 and became the foreman of the jury during the infamous "ricin plot" trial. What made yesterday evening's discussion in Stratford, about his book on the trial and its aftermath, so completely fascinating is how his experience was revelatory - and how it has changed him into a campaigner against the injustices of the 'war on terror' here in Britain. In 2003, anti-terrorism police raided a north London flat after a tip-off from the Algerian government, which was almost certainly based on evidence extracted using torture. They had alleged that there was an Al-Qaeda plot to attack the London underground using the poison ricin. Five men were arrested and Tony Blair said the threat of international terrorism was "present and real and with us now and its potential is huge". In the incredibly paranoid and hysterical period after 2001, the press inevitably went berserk, with The Sun reporting the discovery of a "factory of death" (an sensationalist claim that was recycled following the police raids in 2006 of my neighbours in Forest Gate). 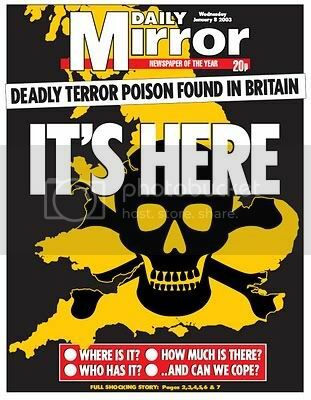 The Daily Mirror front page (below), which was reprinted and displayed last night, had a map of the UK emblazoned with a skull and cross bones and the headline: "It's Here". But after the jury had spent six months hearing evidence, they had heard that no ricin had ever been found, that biological weapons experts at the government's Porton Down Laboratory knew this within two days and that there had never been a sophisticated plot, only loose associations between the five men. After taking a then-record 17 days to reach a decision, they acquitted four of the defendants and found a fifth guilty of the Victorian-era offence of conspiracy to cause a public nuisance, a charge dug up specially for the trial. After the trial was over, however, the jurors saw that the media coverage of the trial bore little relation to the evidence they had heard. Journalists, who had faced a media black out during the trial and hardly attended the court proceedings, preferred to rely on briefings from the police and security services. The story they told was a pack of lies. Britain's most politicised police officer, Metropolitan Police Commissioner Sir Ian Blair, went further: he used the failure to convict to demand legislation for “acts preparatory to terrorism”, because 'terrorists' operate using “very loose-knit conspiracies.” The then home secretary, Charles Clarke, duly obliged. Remarkably, a number of the jurors decided not to simply walk away but to investigate further, meeting the defence lawyer Gareth Peirce, and the some of the defendants themselves. Lawrence Archer was one of those who spoke out when several of the men were rearrested and threatened with deportation. He has given evidence at the secretive Special Immigration Appeals Commission hearings and expressed his horror that the 'ricin' plot was used by Colin Powell as alleged proof that Saddam Hussein had been secretly arming terrorist groups in the approach to the war in Iraq. Last night he described his scepticism whenever he hears reports about 'intelligence', calling it "guesswork based on fourth hand sources, some extracted under torture." A jury trial not only prevented an injustice - it also led some jurors, people like Archer, to take a greater interest in the way the state operates and to continue to believe in a 'duty of care' beyond the courtroom. None of this would have happened without the jury system and the involvement of citizens in the criminal justice system. It's the reason why defending the principle of trial-by-jury is so important and explains why the security establishment, if it could have its way, would favour its abolition in alleged terrorism cases. I knew what the buff envelope was as soon as I spotted it on the doormat; another jury summons. My heart sank. I’d served on a jury in an assault case only two years previously and it had been a brutal experience. The CCTV evidence of a young man being struck on the back of the head with an axe still stayed with me. But this new summons was to the Old Bailey: now that could be interesting. As it turned out, it was life changing. I was to become the jury foreman in the first terrorism trial in Britain since 9/11. The case became known as the Ricin Trial, since the prosecution alleged that a group of Algerian men were conspiring to manufacture explosives and toxins, including the deadly poison ricin, for terrorist purposes. The case came to court in September 2004. Five men stood in the dock, while a further four were scheduled to be tried in a follow-on trial, the Court Service considering, probably correctly, that prosecuting nine defendants at once would have both crammed the courtroom and confused any jury. The defendants were a disparate bunch, mostly associated with each other through the Finsbury Park mosque. Although it has since become inextricably linked with terrorism by the presence of the notorious preacher Abu Hamza, the mosque had previously served a different and rather more peaceful purpose, providing a focal point for the large Algerian community who lived in the neighbourhood. Men would meet, socialise, eat, swap information on jobs and lodgings and even sleep at the mosque, although the latter was an informal arrangement and frowned upon by the mosque trustees. The five Algerian defendants, Kamel Bourgass, Mouloud Sihali, David Khalef, Mustapha Taleb and Sidali Feddag, were all charged on two counts: Conspiracy to murder and “Conspiracy to cause a public nuisance”, a 19th century piece of legislation that had been resurrected by the CPS for the trial. Information had come into the British authorities in early January 2003 that a group of Algerian terrorists was going to strike the UK imminently. The news understandably caused huge consternation at Scotland Yard and within a matter of days Anti Terror Branch officers carried out a raid on a property in Wood Green, North London. The shabby one bed flat, provided for the 17 year old Sidali Feddag whilst his asylum claim was being processed, was searched thoroughly for poisons and explosives. Feddag had met Kamel Bourgass at the Finsbury Park mosque some months earlier and had offered him accommodation in the flat when he realised Bourgass was homeless. However, Feddag had asked Bourgass to leave a matter of weeks before the raid when his brother needed somewhere to stay. Bourgass had duly obliged, but crucially left many of his possessions behind. Among these were some suspicious items: rubber gloves, thermometers, bottles of chemicals, a small quantity of castor oil seeds (the principle ingredient for making ricin), a large sum of cash and most damning of all, a hand written set of recipes for manufacturing a variety of toxins and explosives, contained in a locked sports bag. The recipes were later identified as being written by Bourgass and his fingerprints covered the other suspicious finds. Scientists from the government research laboratories at Porton Down carried out generic testing for the presence of proteins on some of the items found at the scene. One item, a mortar and pestle, showed a very weak positive reaction to this onsite testing, but later highly specific tests for ricin, carried out at the laboratory, proved the initial analysis to be misleading. According to the chief scientist, in his evidence to the Old Bailey, he had declared the tests negative. As far as he was concerned, there was no ricin at Wood Green. A series of arrests followed, although the main suspect, Kamel Bourgass, was missing. Mustapha Taleb was picked up almost immediately, after his fingerprint was discovered on a photocopy of the poison recipes. David Khalef had been arrested some months earlier in Norfolk, found in possession of a copy of the recipes. Mouloud Sihali had been picked up at the same time as Khalef. He had connections with one of the chief suspects in the alleged conspiracy, having let him stay in his flat for a number of weeks. The startling headlines almost certainly scared Kamel Bourgass into fleeing London. Within a few days he was holed up in a Manchester flat belonging to a distant acquaintance. When police arrived at the flat several days later, entirely coincidentally and in order to detain another man unconnected with the ricin plot, Bourgass was recognised and promptly arrested. What happened next was withheld from the ricin trial jury, to avoid prejudicing the evidence. Bourgass broke free from the officers guarding him, snatched a knife from the kitchen and attempted to escape. In the ensuing chaos he violently stabbed police officer Stephen Oake to death and badly wounded several others before he was finally restrained. Shockingly, the myth of the ricin find was soon to have an even greater effect. Despite the fact that Porton Down knew there was no ricin at Wood Green in early January 2003, Colin Powell, then US Secretary of State, mentioned its definite discovery several weeks later on February 5th, as part of his presentation to the United Nations Security Council. Arguing the case for the invasion of Iraq, Powell cited the Wood Green “find” as a cause for grave concern and linked it to an “Iraq-linked terrorist network”. British and American forces invaded the country within a matter of weeks. At the end of the ricin trial, which had lasted seven months, cost an estimated £20 million and caused the jury to deliberate for 17 days, Bourgass was convicted on the lesser, although still serious, charge of Conspiracy to cause a public nuisance. The jury were unable to reach a decision on the Conspiracy to murder charge and were eventually discharged. Bourgass had in fact already been convicted of murder and malicious wounding in a previous Old Bailey trial, kept deliberately secret to avoid any press revelations, and was serving a lengthy jail sentence. The other four defendants, Sihali, Taleb, Khalef and Feddag were found not guilty on all charges. The second, follow on, trial collapsed, as the CPS decided there was little realistic hope of any convictions, as much of the evidence alleged against them was linked to the original defendants. While several of the defendants had entered the UK illegally, they had all served enough time in custody to be released after a few days and were let out on normal immigration bail conditions. A reporting embargo in place since early 2003 had meant that the press had been unable to publicise the case until the verdicts came in. Now, after the jury had announced its decisions, the media had a field day, declaring Bourgass to be “The Toxic Terrorist” and claiming that he had Al Qaeda connections. The original intelligence given to the British authorities was revealed to have come from another Algerian man, Mohammed Meguerba, who had been interrogated by the DRS, Algeria’s notoriously brutal secret police who had a fearsome reputation for using torture during their questioning. The jury went back to their day jobs, but the story wasn’t over for the cleared defendants. Within weeks, the government announced its intention to deport them to their native country, despite the fact that Algeria had an appalling record on human rights and the defendants had been tarred with the brush of “terrorist”. When it seemed that there might be legal difficulties with the deportation process, the British government attempted to negotiate Memoranda of Understanding with the more contentious countries, including Libya and Algeria. (Libya signed up. Algeria refused, on the grounds that it didn’t go in for mistreatment of detainees, so there really was no need). A lengthy legal battle ensued to derail the deportations, but far worse was to come for two of the men. Following the 7th July and failed 21st July 2005 bombings on London Transport targets, and the shooting of Jean Charles de Menezes, the British public were understandably jittery, and fear of terrorism was running at fever pitch. New anti terror legislation was hurriedly put together. In the early morning of 15th September 2005, coincidentally the same day as Home Secretary Charles Clarke announced plans for 90 day detention of terror suspects, police stormed the properties of Mustapha Taleb and Mouloud Sihali. Both were detained as “threats to national security”, although neither has ever been charged with any offence or even interviewed by the police. After several months in jail they were both released, subject to strict immigration bail conditions (Control Orders in all but name). Terms of their release included wearing an electronic tag, being curfewed for up to 22 hours a day, limiting their movements to a small geographical area and having their premises searched regularly. Potential visitors had to be vetted and approved by the Home Office. Sihali eventually had his case heard by the Special Immigration Appeals Commission (SIAC) which rules on foreign deportation matters. In May 2007, SIAC decided that Sihali posed no danger to the British public and lifted his bail conditions, although he remains threatened with deportation to this day and is fighting it through the appeal courts. Mustapha Taleb has not been that fortunate. He was put back in jail for two years, where he was adjudged to be a severe suicide risk by the prison psychiatrist. He currently lives in a provincial town, subjected once again to strict bail conditions and cooped up in a tiny house for 20 hours a day, kept sane by antidepressant drugs. The British government would like to deport him too, despite the fact that he was granted asylum here in 2000, based on evidence that he had been tortured in Algeria. David Khalef has been granted leave to remain in the UK and now lives quietly in London. Sidali Feddag is the only one of the cleared defendants with any real sense of achievement after the ricin trial. Impressed by the British jury system, he has gone on to study for a degree in law. As for me, I was non political before the case. The ricin trial has changed all that. Lawrence Archer is a writer and engineer. This is his first book. Fiona Bawdon, who co-wrote the book, is a respected freelance journalist who writes on legal matters. “Ricin! The inside story of the terror plot that never was” is released by Pluto Press on 11th October 2010.